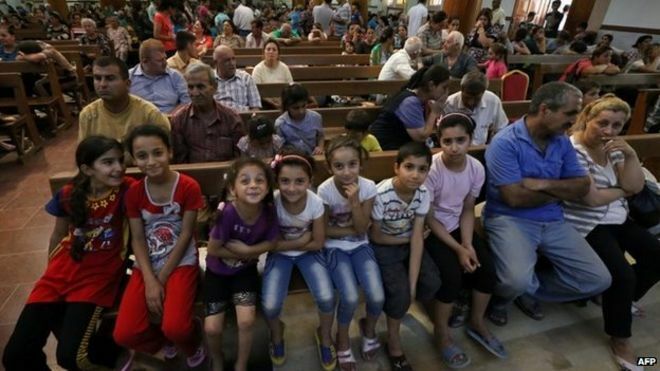 (Aid to the Church in Need) August 28, 2015 – HELP for suffering Christians in Iraq forms the lion’s share of aid announced this month by the UK section of a leading Catholic charity. Aid to the Church in Need (UK) is providing £180,000 (EUR€250,000) for a new convent for the Daughters of the Sacred Heart of Jesus, in Erbil, the Kurdish capital. The Sisters distribute material help, provide counselling, and give Christian education as part of their ministry to more than 100,000 faithful who fled to Kurdistan a year ago. Prompting their exodus was the summer 2014 invasion of Mosul and Nineveh by Islamist terror group Daesh (ISIS). Religious leaders finally called to place national interest above all considerations and to cling to the principles of Christianity, to prevent Lebanon’s plunging into the unknown. (Lebanese Republic Ministry of Information) August 31, 2015 – Religious leaders gathered at the Christian Summit in Bkirki under the chairmanship of Maronite Patriarch Bechara Boutros Rahi, and called upon the various political components to urgently adopt a roadmap that begins with the immediate election of a President of the Republic. Religious leaders urged Deputies to go to the Parliament to elect a head of state, and then form a new government capable of managing the political, social, economic, and vital dossiers. (Agenzia Fides) Beirut, August 31, 2015 – The Islamic-Christian summit scheduled for today, Monday, August 31, to be held at the Maronite patriarchal see in Bkerké, has been postponed until a later date. This was reported by Lebanese official agencies, adding that, however, even today meetings continued with political representatives and Christian members at the patriarchal see in Bkerké. We currently have not been officially communicated the reasons that led to the postponement of the Islamic-Christian summit, but according to Lebanese media the meeting has been postponed for lack of participation of some Muslim leaders. In the dossier, in addition to cases involving illegal property expropriations, the names of Christians seized and made victims of extortion are also mentioned. (Agenzia Fides) Baghdad, August 31, 2015 – There are 14 cases of illegal expropriations of real estate of Christians in Baghdad documented in the first dossier that the Chaldean Patriarchate delivered yesterday to the leaders of the committee, recently set up by the Iraqi political authorities, with the specific task of collecting information and arranging concrete measures regarding the violence suffered by Christians in the Iraqi capital. The delivery of the dossier, which took place on Sunday, August 30, is the first, diligent response of the Chaldean Patriarchate to the demands of the committee, that had urged on behalf of the church, assistance in gathering information on cases of expropriation, abduction, extortion and harassment which in recent months have mainly targeted Christians in Baghdad. In the dossier, in addition to cases involving illegal property expropriations, the names of Christians seized and made victims of extortion are also mentioned. We trust that our parents will understand the steps we are taking and will stand, with God’s assistance, beside their schools and institutions. (The Office of Catholic Schools in Israel) August 31, 2015 – Christian Schools have been offering their educational services to the children of the Holy Land, from all faiths and denominations, for hundreds of years. The churches and monasteries that own these schools have developed the school buildings and facilities and strengthened the educational and moral message based on the love of God and man. We have been categorized for decades as “Recognized and Unofficial” schools and have been partially funded by the Ministry of Education. However, the policies of the Ministry of Education in the last few years have been drying up these educational institutions. The Ministry started a systematic campaign against our schools by unilaterally cutting its support from about 45%, compared to what was before, to 29% of the total cost of a primary school. The Ministry of Education also closed the door for advancement by not allowing our primary school teachers to participate in training courses designed for teachers. They even prevented Ministry instructors from working with our teachers and thus our teachers are prevented from developing in their academic fields. Recently they have even tightened the noose around our necks with regulations limiting the percentage of tuition we can charge – this is a death strike that will prevent our schools from being able to work! Building the annexation wall in their lands might lead the landowners to emmigrate from their homeland and contribute to the ethnic cleansing of Christian from the region. (Society of St. Yves) August 28, 2015 – An EU diplomatic delegation visited Beir Ona in Beit-Jala, on Tuesday the 25th of August 2015, to assess the situation of the area after the Israeli army started working on the agricultural lands in preparation for constructing the annexation wall in Cremisan. The Society of St. Yves – Catholic Center for Human Rights in its capacity as representative of the Salesian Convent briefed the visiting delegation on the latest developments of the Cremisan case, including its most recent petition submitted on July 30th and the Israeli army’s response to it, which rejected the content of the petition and claimed it was an attempt to re-open already closed files, meaning the petitions submitted earlier in July by the Municipality of Beit-Jala and the landowners. The uprooting of 2000+ year old olive trees to build an apartheid wall and confiscate 3000 dunams of land in Beit Jala is a crime against humanity. (Human Rights) Beit Jala, August 30, 2015 – Today (Sunday) we were protesting in Beit Jala when occupation soldiers used violence and arrested three people who were peacefully protesting. The uprooting of 2000+ year old olive trees to build an apartheid wall and confiscate 3000 dunams of land in Beit Jala is a crime against humanity. August 30, 2015 – For the past three years residents of Nabi Saleh, a small Palestinian village near Ramallah, have held weekkly demonstrations to protest the confiscation of the village’s lands and the takeover of their spring by the nearby Jewish settlement, Halamish. The protest on Friday, August 28, saw peaceful marchers chanting as well as youths hurling rocks. When the forces sought to arrest protesters for hurling rocks in their direction, a solider (rumored to be a Zionist with French nationality) went after an 11-year-old boy, whose arm was in a cast. He had the screaming child in a choke hold. The youngster’s sister, mother, and others came to his aid beating the soldier and even, in the case of the boy’s sister, biting the soldier in an attempt to gain his release. Eventually the commanding Israeli officer gave the order to halt the arrest.